Mr. Ahmet Güleryüz, the distinguished artist and author of several maritime books including the well known study THE OTTOMAN STEAM NAVY has just come up with a very remarkable book. 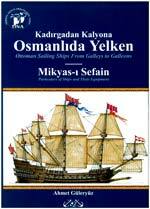 This is a Turkish/English study of the Eastern Mediterranean ships starting with the galleys of the 13. – 14. century, and includes furthermore a transliteration of Diyarbakirli Abdülhamit’s Particulars of Ships and Their Equipment2, a navy technical handbook from the beginnings of the 19. century, including sizes, weights, equipment details of Ottoman Navy Sailing Ships, sail plans, center of forces, conversion tables to European units and much more. The book contains a wealth of very detailed and most enjoyable drawing foldouts by the author, details of miniature and copper engravings, old scantlings, some photographs of surviving vessels into the age of photography… Every page of this book can be recommended wholeheartedly to the interested mariner. Priced with approx. € 50.00 well worth the money. To be obtained through Denizler Kitabevi, Istanbul.